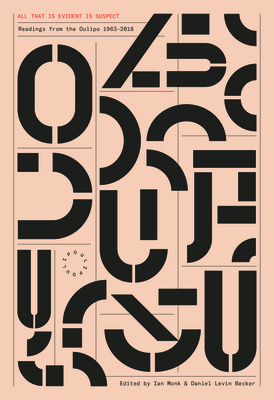 Since its inception in Paris in 1960, the OuLiPo--ouvroir de litt rature potentielle, or workshop for potential literature--has continually expanded our sense of what writing can do. It's produced, among many other marvels, a detective novel without the letter e (and a sequel of sorts without a, i, o, u, or y); an epic poem structured by the Parisian m tro system; a story in the form of a tarot reading; a poetry book in the form of a game of go; and a suite of sonnets that would take almost 200 million years to read completely. Enter All That is Evident is Suspect: the first collection in English to offer a life-size picture of the group in its historical and contemporary incarnations, and the first in any language to represent all of its members (numbering 41 as of April 2018 ). Combining fiction, poetry, essays and lectures, and never-published internal correspondence--along with the acrobatically constrained writing and complexly structured narratives that have become synonymous with oulipian practice--this volume shows a unique group of thinkers and artists at work and at play, meditating on and subverting the facts of life, love, and the group itself. It's an unprecedentedly intimate and comprehensive glimpse at the breadth and diversity of one of world literature's most vital, adventurous presences. DISCUSSED: Sharks as poets and vice versa, the Brisbane pitch drop experiment, novel classifications for real or imaginary libraries, the monumental sadness of difficult loves, the obsolescence of the novel, the symbolic significance of the cup-and-ball game, holiday closures across the Francophone world, what happens at Fahrenheit 452, Warren G. Harding's dark night of the soul, Marcel Duchamp's imperviousness to conventional spacetime laws, bilingual palindromes, cartoon eodermdromes, oscillating poems, m tro poems, metric poems, literary madness, straw cultivation.